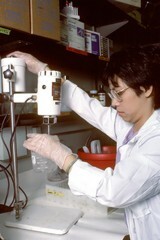 An Asian female laboratory technician performing a step in the estrogen receptor assay test. She is seen with a test tube containing some frozen breast tissue, inserted in a beaker of ice water. She is readying the tube for mixing. The tube is being attached to the appropriate machinery. The technician, wearing rubber gloves and a white laboratory coat is not visible in all slides. This test determines whether antiestrogen drugs or removal of ovaries is likely to be the effective therapy.